From time to time, the Greenbean blog is just a random list of things that are on my mind. This is one of those times. Did you notice that this past week there was what can only be called a “Showdown” going on out in Nevada. Apparently a rancher claims hereditary rights to land that the government seized in 1993 due to a provision in the Endangered Species Act. The feds will let him continue to graze there, but he has to pay a fee, they say, to use land his family has always used. He refuses to pay. It is quite the scene as the Bureau of Land Management has begun seizing his cattle unless he pays the $1.1 million in back grazing fees. Why are the feds acting now. What do they really want? The way of life in the west is different from the rest of the country, and this strikes me as being more of a cultural problem than a law problem. This is the kind of thing that never ends well. Putin is at it again in Ukraine. I’ve already blogged about this (click here), and it seems my analysis was accurate. Putin is upping the ante, and this will now only end in one way–with Ukraine being reabsorbed by the Russian state. I don’t think the U.S. or the U.K. will honor its moral obligation to protect Ukraine, which is something they promised in 1994 when Ukraine voluntarily gave all its nuclear weapons to Russia. Mrs. Greenbean woke me up at 2:45 this morning to see the lunar eclipse. It is the first of four in this lunar eclipse tetrad that spreads out until September of 2015. It was impressive, I have to admit. The moon was a reddish/orangish hue and might be quite frightening if a person didn’t understand the science behind it. I looked at it for a moment and then crawled back in bed. Here comes the interesting part. 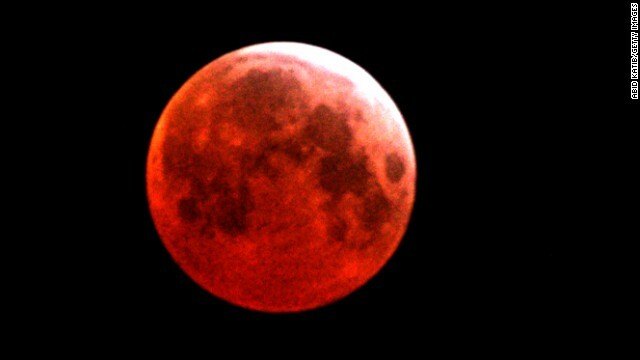 This mornings newspaper reports that San Antonio preacher John Hagee believes that this is a sign that the end is near. Click here for a news report about Hagee and his claims. Of course Hagee is wrong, although he will no doubt make a little coin off his book about it. I don’t know why anyone gives any credence to loons like that (pun intended–loon–lunatic–lunar) when they howl that everything that happens is a sign of the end. (Click here, here and here for other end of the world analysis). These types of people, like Hagee, should never be trusted by anyone again on any issue because they have consistently proven they do not rightly handle the word of God. There is not much to say about the tragic shootings in Kansas. Frazier Glenn Cross, 73 years old, hates Jews. This is supported by his role as a leader in the Klu-Klux-Klan and avid white supremacist activity. He attacked the Jewish center on Passover Eve and killed three people. The problem, for him at least, is that the three people he killed were all self-identified Christians. Much analysis is now taking place over hate crime laws, since he missed his mark. The question seems to be, “Is it a hate crime to kill white Christians?” I take the whole issue to be ridiculous because the crime is not in the hating, the crime is in the killing. Regardless of who this man shot, he should spend the rest of his life in jail. (For why I’m against the death penalty, click here.) I continue to hold firm to my believe there is no such thing as a hate crime. There is only crime. Motivations are pretty meaningless. I’ve made some facetious tweets and left a more substantive comment on someone’s Google+ post about this Bundy nonsense. Let’s put this controversy squarely into the category of things some of my fellow conservatives do that get my hackles up … and perhaps even my dander. It’s not, actually, that the BLM seized the land in 1993. Federal ownership of that land dates back a good ways further: probably to the founding of the State of Nevada. On top of that, there are Federal laws that place certain requirements and allow certain discretion for the Department of the Interior (under which the BLM functions) in claims of “squatter’s rights” or adverse possession. This was litigated in Federal Court, after the BLM modified the fee structure for grazing on the land on account of the endangered species (what happened in 1993). And Cliven Bundy lost. The man has said explicitly that he obeys almost no Federal laws. As someone joked in a comment to a post about this somewhere else, “Mr. Bundy further stated that he pays his Federal income tax to Floyd the local barber” (or hilarious words to that effect). This is not a legitimate “state sovereignty” controversy. This is a man who, along with his kith and kin, use bellicose terminology and have little better than abject contempt for all things Federal: including the several Federal Court orders he has defied. I don’t doubt that he has no comprehension of the meaning of the 10th Amendment or any statutory or case law on the subject. Well, today is tax day. Tell you what. There’s a new way you can get away with not paying your taxes. Get a bunch of well-armed militia from several states to swarm to your house in protest or to accompany you to your future audit. And hello there. I’m trying to make my way back to the blogs I personally enjoy. And if one of your other readers, Carroll Boswell, should happen upon this comment: hello to you too, Carroll: I haven’t forgotten about your blog either. Don’t let the length of this comment fool you, though. I type stuff like this in a flash. So I still fall back on my excuse that time and stress have made me notably less sociable online in the last couple of months. virgil, i’ll take your comments anytime i can get them! and yes, i saw some of your tweets, although they come so fast and furious that i sometimes find my feeble mind cannot keep up. now, as to the substance of the range-warrior. i have little doubt that this is a very unstable man and that he is in violation not only of the law but of common sense. we have a way of disputing things in this country and it is in the judicial system. he should hire a really good attorney rather than call foxnews and his militia friends. my major concern is how quickly this has escalated. now the whole situation is a powder keg and someone is going to have to come to calmer senses before it gets worse. i don’t want this rancher becoming a martyr for some kind of neocon movement. i’m a conservative, but not a fanatic. the federal gov’t has a role to play in society. i just wish it would play a wise role here and not let it get out of hand. i agree that it is not a states-rights issue, but there is a cultural divide in the way the land and its uses are perceived. the feds there could have handled this situation much, much better. as to avoiding taxes, i’d rather pay my taxes than feed and supply a militia. i don’t have that many bedrooms here. As for “hate crimes” : I just think crime is crime. So, I agree with you. I dig and appreciate your opinions, sir!